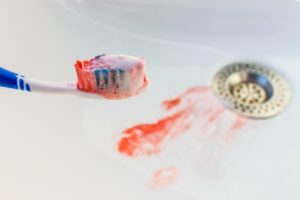 There are few things more unsettling than waking up to start your morning oral care routine and seeing blood appear in your sink as you brush. You may find yourself asking many questions, such as “Why is this happening?” You may ask “How do I fix this?” You’re in luck, because your dentist offers professional treatment and therapy for periodontal disease. To learn more about the causes, symptoms, and treatments for periodontal disease, keep reading this post from your dentist in Gahanna! Periodontal (gum) disease is a condition that occurs when plaque and tartar build up at or below the gum line. After enough accumulation, soft tissue and alveolar bone (bone inside the tooth sockets) will begin to deteriorate. This will eventually lead to tooth loss. Periodontal disease includes two major forms: gingivitis and periodontitis. Gingivitis probably sounds more familiar because it’s far more common in the population. It’s considered the early stage of gum disease and can be easily reversed. Periodontitis is a more developed form of gum disease, which can eventually lead to the destruction of gum and bone surrounding teeth. Both forms of periodontal disease are accompanied with inflammation and red swollen gums. However, chronic periodontitis comes with loose teeth, exposure of the tooth root, receding gums, and the formation of pockets between the gums and teeth. It’s important to distinguish the two because the treatments for both differ considerably. Swelling gums or gums that look red or purple. Healthy gums should appear light pink and feel firm. Patients who notice signs of gum disease need to visit a dentist as soon as possible. The only exception is if you haven’t flossed in a long time and notice minimal bleeding afterwards. As long as it doesn’t continue after this initial discovery, it’s likely not gum disease. Otherwise, schedule an appointment to get your gum disease in Gahanna treated. Gingivitis is much easier to reverse with simple improvements to your oral care routine and more frequent visits to the dentist. In fact, your oral health has the potential to be completely restored when only gingivitis is present. To do this, you need to have all tartar, which is a calcified form of plaque that can only be removed by a dentist, scaled down. Unfortunately, periodontitis is a chronic illness and will need to be managed for life if developed. While you can avoid most of the health effects with strict care and monitoring, you’ll need to be on guard for life. Have more questions about treating and recognizing gum disease? Schedule a visit with your dentist today! Dr. Joy Todd earned her DMD degree from the University of Kentucky. With over 15 years of experience working in dentistry, she’s fully qualified to treat all forms of gum disease and help patients manage their conditions. To learn more about her practice, contact her through her website.